The news outlet has confirmed that Robert Downey Jr. is in final negotiations to star as Lestat Du Lioncort in a re-boot of the series being developed at Universal. It is not clear which of the ten books the studio will be making, however with Downey Jr. becoming Lestat, it more than likely will be one of books were he is featured more prominently. My money is on "The Vampire Lestat". Unfortunately the only news surrounding the scoop is Robert Downey Jr., outside of him, there is no news on a director, producers, a script, a shooting schedule or which book the film will be based. This would mark the third time Lestat will portrayed on screen and by the third actor. People probably remember Lestat best, as played by Tom Cruise in the 1994 film Interview with a Vampire. He was also later played by Stuart Townsend in the terrible 2002 film, Queen of the Damned directed by Michael Rymer. This news also marks the third potential franchise Robert Downey Jr. will be starring in; Iron Man and "Sherlock Holmes" being the other two. I love Robert Downey Jr. and will watch him do just about anything and having him putting his unique talents in the character of Lestat will be very intriguing. I can say he has the potential to make Cruise's portrayal child's play, but a lot is riding on just how this project develops. 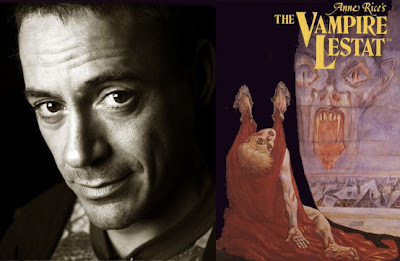 Anne Rice creator of The Vampire Chronicles novels told BD, "I can say without hesitation that I love Robert Downey Jr. and I think he would make a fabulous Vampire Lestat. He is a major actor, a powerhouse of talent and personality, and he evinces an irrepressible and seductive charm. He would bring great energy and skill to the role. I would love to see this happen. I've loved Robert Downey Jr. ever since I saw him in Restoration years ago, and I thought he was magical and powerful in Iron Man." Obviously Rice has given her blessing.